Purpose: The purpose of this study was to determine the demographic pattern of patients with thyroid disease and to evaluate the clinical activity score (CAS) of patients with thyroid eye disease (TED). Subjects and Methods: A hospital-based cross-sectional study was conducted in patients diagnosed with thyroid dysfunction attending the Outpatient Department of Ophthalmology, Eastern Nepal, from June 2015 to July 2016. Demographic data, complete ocular examinations, thyroid eye signs, severity score (NOSPECS), and CAS were recorded and analyzed. Results: Of the 201 patients with thyroid dysfunction recruited, 40.8% (n = 82) had TED. Among patients with TED, 46 (56%) were hyperthyroid, 34 (41.4%) hypothyroid, and two (2.32%) euthyroid (P = 0.005). The mean duration of thyroid dysfunction in patients with TED was 2.96, median 2 years (P = 0.007). The mean age of the patient was 41.26 ± 11.01 years, with male:female ratio 1:4.7. Exophthalmos was seen in 39%. Eleven patients had diabetes mellitus, ten had hypertension, two myasthenia gravis, and two had cardiovascular disease. Significant association was seen between thyroid status and mean CAS (P < 0.001) and NOSPECS (P < 0.001). Hyperthyroidism was significantly associated with the severity of CAS and NOSPECS (P = 0.006 and P = 0.004, respectively). In logistic regression analysis, the occurrence of TED was influenced by thyroid status (P = 0.005, odds ratio [OR]: 1.79) and mean CAS (P < 0.001, OR: 49.17), age, glaucoma but not by gender, diabetes mellitus, duration of diabetes, hypertension, and cardiovascular disease. Conclusions: TED was more predominant in female and hyperthyroid. A significant associated was seen between hyperthyroid and severity of CAS and NOSPECS. A close synchronization between endocrinologist and ophthalmologist can decrease ocular morbidity. TED is clinically evident in 25%–50% of patients with Graves' disease and 3%–5% of cases develop severe eye disease.,, Palikhe et al. from Nepal reported 71.7% prevalence of TED; 75% were hyperthyroiditic, 16.7% hypothyroiditic, and 8.3% euthyroid. Kashkouli et al. showed that 53.4% had graves, 44.1% hypothyroid, and 5.5% euthyroid. In another cohort of 120 Caucasian patients with TED, 90% had Graves' disease, 7% euthyroid, 3% Hashimoto thyroiditis, and 1% had primary hypothyroidism. Considering increasing prevalence of TED among patients with thyroid dysfunction and its significant impact in patient's ocular morbidity, TED has become an important health concern. On reviewing the literature, there are limited data reported in the Nepalese population. We, therefore, performed this study was to determine the pattern of patients with thyroid disease and to evaluate the severity of ophthalmopathy in patients with TED, in the Eastern Nepal. This can help in planning a structured multidisciplinary approach in the management of patient with thyroid disease. This is a hospital-based cross-sectional study, conducted on patients' ≥18 years of age with thyroid dysfunction, presenting to the outpatient Department of Ophthalmology and or referred from the Endocrine clinic, Department of Internal Medicine, Eastern Nepal, from June 2015 to July 2016. After obtaining an informed consent, a standardized pro forma was filled. Detailed ophthalmology examinations included best-corrected visual acuity, soft-tissue changes, periorbital changes, measurement of proptosis by Hertel's exophthalmometer, extraocular movements, lid signs, anterior segment evaluation for involvement of cornea, pupil reaction, and funduscopy examination. Intraocular pressure (IOP) was measured with Goldmann applanation tonometer. Glaucoma was confirmed if the patient had IOP of >21 mmHg in the primary gaze with typical glaucomatous optic neuropathy and/or visual field changes. Patients with TED were further evaluated for disease activity (Mourits Clinical activity score [CAS]) and NOSPECS score. The activity of ophthalmopathy was scored using the method of Mourits et al. (1989). For NOSPECS classification, the signs were further classified into four groups as follows: 0, 1, 2, and 3 groups based on the severity. The total eye score (TES) ranged from 0 to 63. Higher the score is worse the severity of the disease. The score of each class was equal to the number of class multiplied by the number of grade at each class. TES was the sum of all the scores in the six classes as described by Kashkouli et al. in their study. Ultrasound of orbit (B-Scan) was carried out for evaluation of extraocular muscle thickness. Computed tomography scan of orbit was done whereever required to evaluate the involvement of extraocular muscles and optic nerve. Ethical clearance was slot from the Institutional Review Committee, BPKIHS and is in accordance with the Declaration of Helsinki. Statistical analysis was performed using SPSS, version 16 (SPSS 16- IBM Corp. Armonk, NY). Categorical variables were expressed as counts and percentages. The Chi-square test for independent proportions or Fisher's exact test was used. Nonparametric tests were used for the comparisons of two variables (Mann–Whitney test for two variables and for >2, Wilcoxon signed-rank test). Multiple logistic regression analysis was used to analyze the joint effect of the independent variables on the presence of TED. P < 0.05 was considered statistically significant. In a cohort of 201 patients with thyroid dysfunction, 42.7% (86) were hyperthyroid, 55.22% (111) were hypothyroid, and 1.99% (4) euthyroid. The mean age of the patient in the population was 42.39 ± 12.37 years, ranged from 40 to 60 years. The prevalence of thyroid dysfunction was more in female than male (82.6%, 166 vs. 17.4%, 35), which was nearly five times more than in males; however, it was not found statistically significant (P = 0.941). [Table 1] shows the distribution of characteristics in the study population. In most of the patients (n = 108, 53.7%), the duration of thyroid dysfunction ranged from 1 to 5 years with mean 2.58 ± 2.77 years of age and median 2 years. Among all the recruited patients, 22 (11.1%) had diabetes mellitus; of which 8 (36.36%) patients were hyperthyroid and 14 (63.63%) hypothyroid. 36 (18%) patients were hypertensive. Myasthenia gravis was presented in two patients (0.99%) both them were hypothyroid. Glaucoma was seen in ten patients (4.97%); all of them belonged to the hyperthyroid group. History of smoking was present in 7 (5%) patients. Out of all the recruited individuals, 89 patients (44.3%) had one or the other ocular symptoms, foreign body sensation being the most common presenting symptoms in 61.79%. [Table 2] shows the distribution of patients' characteristics based on the type of thyroid status. While comparing in between the three groups, there was a significant difference in the age of the patient between the three groups (P = 0.001). Among the recruited patients, the prevalence of TED was 40.8% (n = 82), of which 46 patients (56%) were hyperthyroid, 34 (41.4%) hypothyroid, and 2 (2.32%) euthyroid. 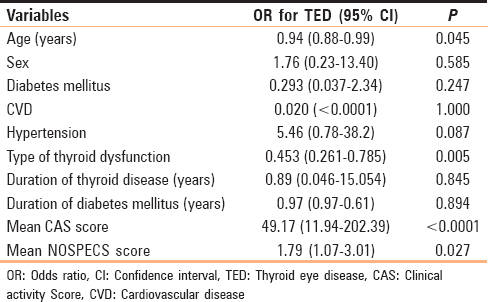 TED was statistically significantly associated with hyperthyroid (P = 0.005). Majority of the patients had unilateral eye involvement in 53 patients and bilateral in 29 patients. The mean duration of thyroid dysfunction in patients with TED was 2.90 ± 3.19 years and in those without thyroid dysfunction was 2.36 ± 2.43 years (P = 0.007). The mean age of the patient with TED was 41.26 ± 11.01 years and without TED was 43.18 ± 13.12 years (P = 0.230). There were 15 males and 67 females, which was nearly five times more in females than in male (P = 0.78). Among the patients with TED, 11 (13.41%) had diabetes mellitus, 2 (2.4%) myasthenia gravis, 10 (12.1%) hypertension, and 2 (2.4%) had cardiovascular disease. Statistically significant relationship was seen between occurrence of TED and duration of thyroid dysfunction (P = 0.007) but not seen with diabetes mellitus (P = 0.374), cardiovascular disease (P = 0.164), hypertension (P = 0.058), and myasthenia gravis (P = 0.164). 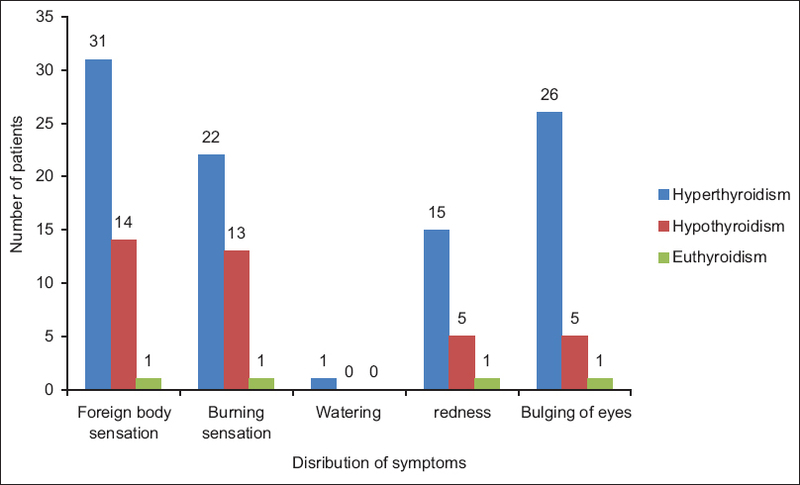 Foreign body sensation was the most common presenting symptoms (56%), followed by burning sensation (43.9%), bulging of eyes (39%), redness (25.6%), and watering (1.21%) [Figure 1]. The most common thyroid eye sign was Dalrymple sign (eyelid retraction in primary gaze) in 80%, followed by Enroth's sign (puffiness of eyelid) in 75.6%. [Table 3] shows the distribution of signs in patients with TED. Dry eye was seen in 27 (32.9%) patients: 18 patients were hyperthyroid, 9 hypothyroid, and not seen in a patient with euthyroid (P = 0.022) in the total population. Eight patients with TED had glaucoma. Statistically significant relationship was seen between the duration of proptosis and thyroid dysfunction (P = 0.000). The presence of proptosis was significantly related with hyperthyroid state (P < 0.0001). On comparing TED with other parameters, TED was adversely affected by the presence of glaucoma (P = 0.012), severity of limitation of extraocular movements (P < 0.0001), advance grade of proptosis (P < 0.0001), and longer duration of proptosis (P < 0.0001). All the patients with TED were further evaluated for the severity of TEDs and further classified according to NOSPECS classification and the CAS. While comparing thyroid status with CAS and NOSPECS, hyperthyroidism had a significant association with severity CAS and NOSPECS; P = 0.007 and P = 0.004, respectively. There was a significant association between the type of thyroid dysfunction with mean CAS and NOSPECS score [Table 4]. Multiple logistic regression analysis revealed that age, glaucoma, status of thyroid dysfunction, and severity of CAS and NOSPECS were independent risk factors for TED. Diabetes mellitus, duration of DM, duration of thyroid dysfunction, cardiovascular disease, hypertension, and gender did not show any association [Table 5]. All the patients were managed conservatively (preservative-free tear substitutes), except one with restrictive myopathy and secondary glaucoma was treated with oral steroids in tapering dose and topical 0.5% timolol twice a day. TED is an autoimmune disease affecting ocular and orbital tissues. It is the most common cause of orbital inflammation and proptosis in adults. It can manifest in all thyroid states, most frequently in Graves' disease. The epidemiology of TED varies geographically.,,, Multifactorial etiologies may affect the prevalence of TED in different ethnic groups. In the present study, the prevalence of TED was 40.8%, more prevalent in patients with hyperthyroid (P = 0.005, odds ratio [OR]: 0.453). This was less than that reported from Nepal (71.7%), with hyperthyroid being the more prevalent in 75%. On reviewing the literature, TED was seen clinically evident in 25%–50% of patient with Graves' disease and 3.5% of cases develop severe eye disease., Woo et al., in their study, reported the prevalence of TED in 17.3% of dysthyroid patients. Although TED most commonly occurs in the presence of hyperthyroidism, it has been reported in euthyroid and hypothyroid state too.,,, In the present study, 41.4% were hypothyroid and 2.32% euthyroid. Mourits et al. showed that among patients with clinical ophthalmopathy, 90% had Graves' hyperthyroidism, 1% had primary hypothyroidism, and 6% were euthyroid and 3% had Hashimoto thyroiditis. Unlike this, in a study conducted by Kashkouli et al. in Iranian patients with thyroid-associated ophthalmopathy, 303 cases had TED. There were 53.4% with hypothyroid (9.3% Hashimoto disease), 5.5% euthyroid, and 41.1% had Graves' disease. The occurrence of TED was influenced by Graves' disease with OR: 42.857, P < 0.001. TED was frequently encountered in patients aged between 40 and 60 years (36, 45%); with mean age of 41.26 ± 11.01 years (P = 0.071). This was comparable to other studies reported in the literature.,, Women are two to five times more likely to be affected by TED than men; however, this largely reflects the incidence of Graves' disease in women.,,,,,,, This is comparable to our study with a prevalence of TED being more frequent in female which was nearly five times more than in male. Unlike this, some literature have reported male as a predisposing risk factor., Kashkouli et al. reported the prevalence of TED was 60% in male which was nearly two times the prevalence of TED seen in female. The presence of TED was influenced by the duration of thyroid dysfunction. Similarly, in this study, too statistically significant association was found between the occurrence of TED and duration of thyroid dysfunction (P = 0.007). Among the patients with TED, 13.41% had diabetes mellitus, 2.4% myasthenia gravis, 12.1% hypertension, and 2.4% had cardiovascular disease. Type II diabetes mellitus and autoimmune thyroid disease have shown an association. Studies reported in the literature have shown a higher incidence of thyroid dysfunction in individuals with Type II diabetes mellitus.,, Comparing the proportion of TED in patients' Type II diabetes mellitus, 13.41% in this study was higher than reported by other studies (6.8%), EUGOGO study (9%) and Kashkouli et al. (3.6%). We could not elicit significant association between comorbidities such as diabetes mellitus (P = 0.374), hypertension (P = 0.081), cardiovascular disease (P = 0.164), and myasthenia gravis (P = 0.164). Kashkouli et al. reported 10.6% (32 cases) with cardiovascular disease, 3% (9 cases) autoimmune disease, 3.6% (11 cases) diabetes mellitus, and 0.7% (2 cases) had myasthenia gravis. They too did not find considerable relationship between presentations of TED and any comorbid conditions. The presence of myasthenia gravis in patients with thyroid disease highlights the need of evaluation of all the patients presenting with myasthenia gravis for thyroid dysfunction and vice versa. The ocular complaint was observed in 44.27% of patients; foreign body sensation being the most common presenting symptoms in 61.79%. Bartley et al. reported eyelid retraction as the most common sign of Graves' ophthalmopathy and being present at diagnosis in 75% of patients. In a study done by Kashkouli et al., bilateral proptosis (9.9%), burning sensation (5.4%), pain behind the eye (5.3%), and puffiness (4.7%) were the most common signs and symptoms. The frequency of extraocular muscle involvement in our study was 9.4%, which was < 62% reported by Bartley et al. and 22.1% by Kashkouli et al. Soft-tissue involvement was observed in 90% in Wiersinga study, which was 40.9% in a study conducted by Kashkouli et al. Sight loss due to optic neuropathy in the literature ranges from 6% to 34%., We did not have any patients with clinical features suggestive of optic neuropathy. Many studies have shown an association of glaucoma with thyroid disease.,,, There is 1.4–7.4 folds increase in the incidence of glaucoma in patients with thyroid dysfunction than the control groups.,, In this study, 4.97% patients had glaucoma, all of them belonged to the hyperthyroid group. CAS and NOSPECS scores were significant association of thyroid status. On comparing TED with other parameters, TED was adversely affected by the presence of glaucoma, proptosis, severity of limitation of extraocular movements, advance grade of proptosis, and longer duration of proptosis. Logistic regression analysis revealed that age, type of thyroid disease, the and severity of CAS score and NOSPECS were independent risk factors for TED. However, the statistically significant association was not seen with diabetes mellitus, duration of diabetes mellitus, duration of thyroid dysfunction, cardiovascular disease, hypertension, and gender. On reviewing the literature, we could not find data comprehensively exploring TED and its thyroid status and with disease activity from Nepal; hence, this can aid in determining the frequency of TED in patients with thyroid disease and to evaluate its severity. Kashkouli et al. reported a significant relationship between the presentation of TED and active smoking of the patients (P < 0.0001) while no significant relationship with passive smoking (P = 0.181). The occurrence of TED was influenced by cardiovascular disease (OR = 5.346), Graves' disease (OR = 47.507), radioiodine therapy (OR = 2.590), and antithyroid medications (OR = 0.650). Wool et al., in 2013, revealed that female gender, young age, Graves' disease, dermopathy, antithyroid medication treatment, duration of thyroid disease, history of smoking, and radioiodine treatment were independent risk factors for TED but not seen with diabetes mellitus. Mathur et al. also showed that patient with a severe course of disease had a higher CAS score (P = 0.007). However, they failed to find an association of TED with DM and hypertension. The mean CAS score was significantly associated with laterality of TED (unilateral vs. bilateral disease) with P = 0.003 and activity state of TED (P = 0.004). This is a hospital-based cross-sectional study. Other risk factors for TED such as smoking, body mass index, duration of treatment (antithyroid drugs and radiotherapy), and family history were not evaluated. We could not perform the thyroid-stimulating hormone receptor antibody test due to its unavailability in our setup. The prevalence of TED in patients with thyroid dysfunction was 40.8%. TED was more common in female and hyperthyroid. Hyperthyroidism was significantly associated with the severity of CAS and NOSPECS. A larger prospective study will help us to know about the influence of risk factors on the severity of CAS score and NOSPECS in patients with TED. The authors would like to acknowledge Professor Surya Niraula, BP Koirala Institute of Health Sciences, Dharan, Nepal, for his help in the statistical analysis. This study was financially supported by BPKIHS Research Fund. Gürdal C, Saraç O, Genç I, Kırımlıoǧlu H, Takmaz T, Can I, et al. Ocular surface and dry eye in Graves' disease. Curr Eye Res 2011;36:8-13. Tani J, Wall JR. Autoimmunity against eye-muscle antigens may explain thyroid-associated ophthalmopathy. CMAJ 2006;175:239. K-Jafari A, Sadeghi-Tari A, Minaee-Noshahr N, Ameri A, Anvari F, Ali-Mahmoudi A, et al. Ocular movement disorders and extraocular muscle involvement in Iranian Graves' ophthalmopathy patients. Binocul Vis Strabismus Q 2010;25:217-30. Khalid BA, Ng ML. Thyroid eye disease – Medical or surgical therapy? Ann Acad Med Singapore 1991;20:273-6. Bahn RS, Heufelder AE. Pathogenesis of Graves' ophthalmopathy. N Engl J Med 1993;329:1468-75. Palikhe S, Thakur A, Shah DN, Sharma AK, Acharya N. Ocular Manifestations in thyroid eye disorder: A cross-sectional study from Nepal. Int J Clin Med 2016;7:814-23. Kashkouli MB, Jam S, Sabzvari D, Ketabi N, Azarinia S, Seyed Alinaghi S, et al. Thyroid-associated ophthalmopathy in Iranian patients. Acta Med Iran 2011;49:612-8. Bartley GB, Fatourechi V, Kadrmas EF, Jacobsen SJ, Ilstrup DM, Garrity JA, et al. Clinical features of Graves' ophthalmopathy in an incidence cohort. Am J Ophthalmol 1996;121:284-90. Werner SC. Modification of the classification of the eye changes of Graves' disease: Recommendations of the Ad hoc Committee of the American Thyroid Association. J Clin Endocrinol Metab 1977;44:203-4. Barrio-Barrio J, Sabater AL, Bonet-Farriol E, Velázquez-Villoria Á, Galofré JC. Graves' ophthalmopathy: VISA versus EUGOGO classification, assessment, and management. J Ophthalmol 2015;2015:249125. Mourits MP, Koornneef L, Wiersinga WM, Prummel MF, Berghout A, van der Gaag R, et al. Clinical criteria for the assessment of disease activity in Graves' ophthalmopathy: A novel approach. Br J Ophthalmol 1989;73:639-44. Bartley GB. The epidemiologic characteristics and clinical course of ophthalmopathy associated with autoimmune thyroid disease in Olmsted county, Minnesota. Trans Am Ophthalmol Soc 1994;92:477-588. Woo KI, Kim YD, Lee SY. Prevalence and risk factors for thyroid eye disease among Korean dysthyroid patients. Korean J Ophthalmol 2013;27:397-404. Ackuaku-Dogbe EM, Akpalu J, Abaidoo B. Epidemiology and clinical features of thyroid-associated orbitopathy in Accra. Middle East Afr J Ophthalmol 2017;24:183-9. Manji N, Carr-Smith JD, Boelaert K, Allahabadia A, Armitage M, Chatterjee VK, et al. Influences of age, gender, smoking, and family history on autoimmune thyroid disease phenotype. J Clin Endocrinol Metab 2006;91:4873-80. Prummel MF, Bakker A, Wiersinga WM, Baldeschi L, Mourits MP, Kendall-Taylor P, et al. Multi-center study on the characteristics and treatment strategies of patients with Graves' orbitopathy: The first European group on Graves' orbitopathy experience. Eur J Endocrinol 2003;148:491-5. Wiersinga WM. Preventing Graves' ophthalmopathy. N Engl J Med 1998;338:121-2. Kim M, Kim TW, Park KH, Kim JM. Risk factors for primary open-angle glaucoma in South Korea: The Namil study. Jpn J Ophthalmol 2012;56:324-9. Lee AJ, Rochtchina E, Wang JJ, Healey PR, Mitchell P. Open-angle glaucoma and systemic thyroid disease in an older population: The Blue Mountains Eye Study. Eye (Lond) 2004;18:600-8. Cross JM, Girkin CA, Owsley C, McGwin G Jr. The association between thyroid problems and glaucoma. Br J Ophthalmol 2008;92:1503-5. Mathur C, Singh S, Sharma S. Prevalence and risk factors of thyroid-associated ophthalmopathy among Indians. Int J Adv Med 2016;3:662-5.